September 10th, 2014 in San Diego was an eye opener. The U.S. Department of Defense has given the San Diego Unified School District's police a 14 ton military armored vehicle. As the news became widely available, an elementary school went into lockdown. The timely set of events seemed to justify the acquisition, but it turned out to be an off-campus argument between a mother and her 19 year old son. 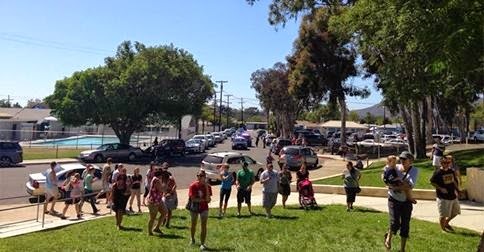 Fletcher Hills Elementary school parents were terrified when notified that the school had been placed in lockdown. Parents were not subsequently told that their children were available for pickup or that the situation had not been a threat to the school. El Cajon Police officers say the commotion started Wednesday when Christopher Wilson, 19, was walking down the street and got into a confrontation with a homeowner, about a block away from Fletcher Hills Elementary. The district said the rescue vehicle is one of the ways it is responding to the 2012 mass shooting at Sandy Hook Elementary in Newtown, Connecticut, and preparing itself for potential disasters in the future. We have since been told that the homeowner in question was Mr. Wilson's mother. She had thrown him out of the house and then called the police. Wilson's mother told NBC 7 that her son also has a restraining order against him by his father. We did not find any reports of Wilson's mother accusing him of brandishing a weapon. Several reports specified that Wilson had removed a hatchet or other wedged object from a bag and then walked past the school. It is unclear who witnessed him remove the object from the bag. Later, a campus supervisor told police the suspect walked past the school, (El Cajon police Lt. Rob) Ransweiler said. The supervisor recognized the suspect and followed him to the front yard of his Chatham Street home near North Westwind Drive, just east of the campus. Officers arrived and tried to convince the man to come outside. They also called his mother, who made similar pleas (via bull horn), but he wasn't in the home, Ransweiler said. A hatchet wasn't located either. Given the current information, Wilson may have grabbed a cell phone from a backpack and simply left. However, the news media immediately painted him as a mad-man who "forced a school into lockdown." News reporting sensationalism isn't a surprise, but the timing is particularly convenient. The Mine Resistant Armored Vehicle (MRAP) was acquired via the 1033 program. The program allows the federal government to provide surplus military equipment to law enforcement. San Diego Unified paid just under $5,000 shipping cost for the vehicle. The cost to remove weapons from the vehicle was not reported. The vehicle's capability of rearmament was not revealed, but we suspect all the weapon mounts are intact and available. If memory serves, our troops in Iraq and Afghanistan could not get these MRAP for several years. Now, SDUSD says the vehicle is needed to truck around donated medical supplies? This acquisition is so unjustified that even instilling fear for "the children" doesn't resonate. Extremely knowledgeable, professional, with excellent follow up and just all around great to work with. Throughout the process I spoke with a few of the installers as well who were extremely friendly and answered all my questions. All in all a great experience I would definitely recommend mb parts …. The information you have given in the blog really marvelous and more interesting new shoes for crossfit. Fine method of telling, and enjoyable article to acquire factual statements www.gympros.com. If you love traditional Monopoly, which is a classic and diverting board game which is just right for family night, or any of the several Monopoly casino such as once around Deluxe, you'll probably love this online roulette game, too! We Endeavour to price just about all JCB loading spades at most aggressive rates. Why all of us is not the same as additional grow sale businesses, used plant machinery for sale, is that as well as offering reasonable prices for our JCB loading shovels, we are able to additionally guarantee the shovel is quality, too.